Kate Shaw’s exquisitely painted landscapes deal with transformations that link the psychological self to the physical world. Shaw’s works are a beautiful celebration of the transformative environment. Masterful use of paints and resin mimic nature’s flowing transformations through transmuted lava flows, a gnarled tree, an iceberg. 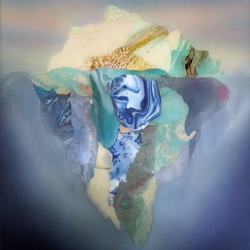 Kate Shaw has participated in many national and international group and solo shows, and her works are in held in important private and public collections in Australia, the USA, Korea and the UK.